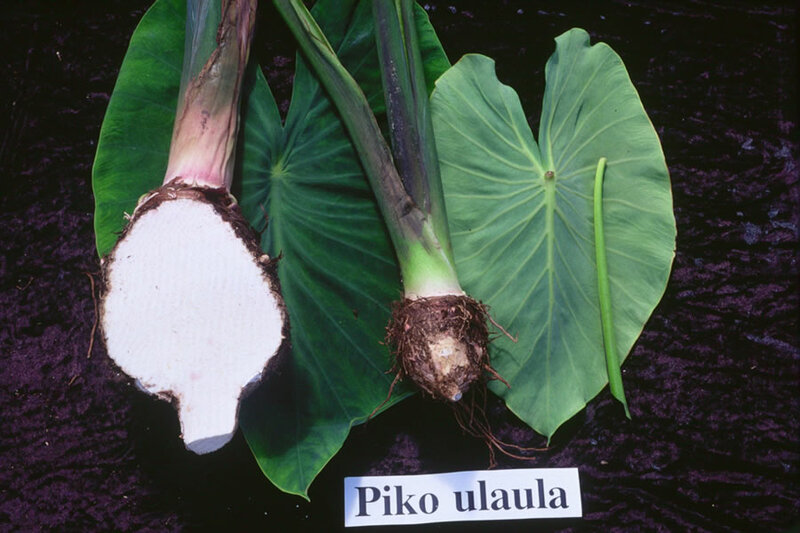 General Characteristics: Medium in height, erect, moderately stocky, maturing within 12 to 15 months, producing from 5 to 10 oha; distinguished from Piko Lehua-apei by lack of crinkled tissue on leaf blade and from other Piko varieties by the lilac-purple corm flesh. Petiole: 75 to 100 cm. long, dark green with dark brown shading near base and a narrow reddish-purple edge, a dark reddish-purple ring at base with lighter reddish-purple-flecked area for 3 to 5 cm. above. Leaf blade: 35 to 50 cm. long, 25 to 35 cm. wide, 25 to 40 cm. from tip to base of sinus, sagittate, chartaceous, dark green with bluish cast; lobes acute with narrow sinus. Corm: Flesh lilac-purple with dark lilac-purple fibers; skin dark lilac-pink. Origin, and derivation of name: Native variety; Ulaula, meaning reddish, refers to pink corms which make "red" poi. Distribution: Apparently rare; has done well at Pensacola Branch Station under upland culture.